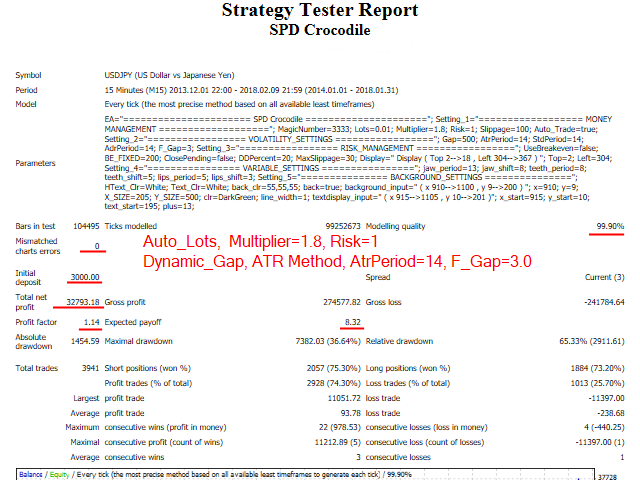 Algorithm of this system is based on Bill Williams' Alligator indicator. This represents the Jaw, the Teeth and the Lips of the Alligator. It was designed to help confirm that a trend is in effect and in what direction. As with all moving averages, the shortest one (green) moves first, followed by the middle (red) and then longer average (blue). Creator Bill Williams used 13, 8 and 5-period averages, brought forward 8, 5 and 3 periods, respectively. Colors are usually blue, red and green, respectively. The Alligator is resting when the three averages are twisted together progressing in a narrow range. The more distant the averages become, the sooner the price move will happen. The averages continuing in an upward direction (green followed by red and blue) indicates an emerging uptrend which we interpret as a signal to buy. The averages following each other in the reversed order down the slope are a strong signal of an unfolding downtrend, so sell. 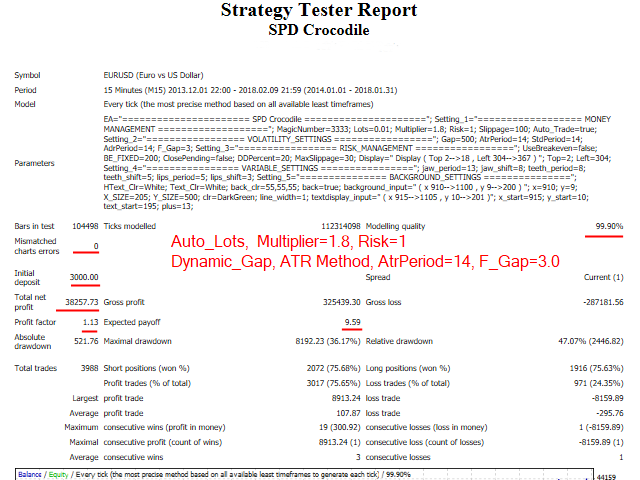 This strategy is to adapt by adding the Average true range (ATR), Standard deviation (STD) and Average daily range (ADR). These functions are used to calculate the area of loss recovery with two methods, dynamic and fixed. Trades on different timeframes. Recommended for M15. Initial deposit: $1000+ (minimum Lots = 0.01). 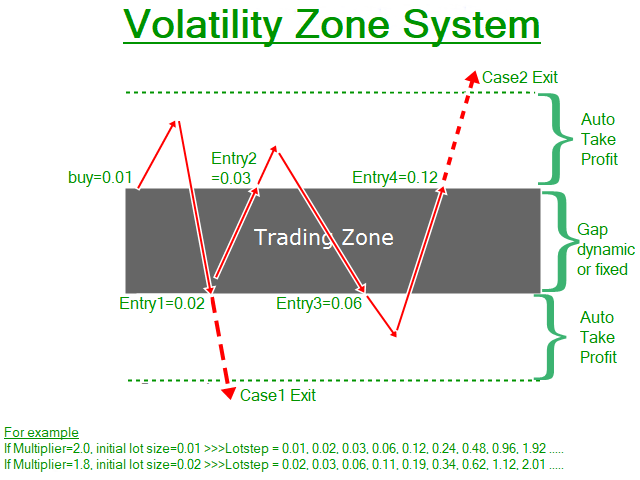 This Expert Advisor uses the recovery zone algorithm. Uses dynamic or fixed pending orders. 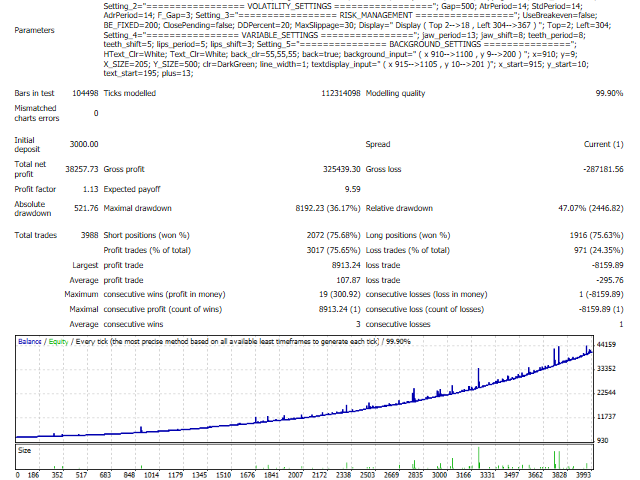 Using real tick data in backtest with 99.9% modeling quality. 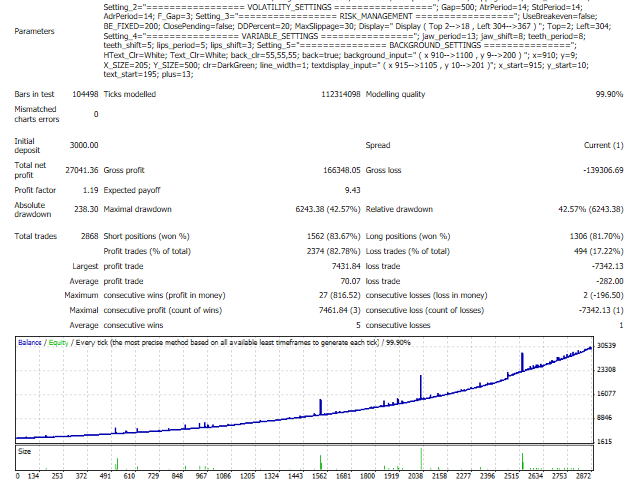 It is recommended to use a low spread ECN Broker. MagicNumber - Magic number to set the ID for each EA. UseLotsize - set as Auto_Lots or Fixed_Lots. 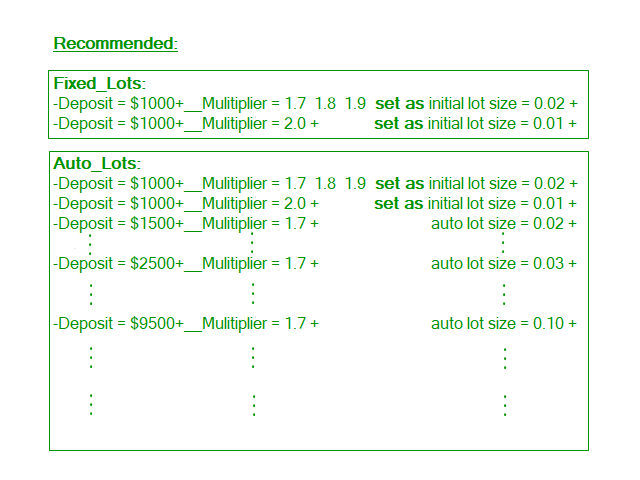 Multiplier - previous lot size will multiplied. Risk - set the percentage of risk. 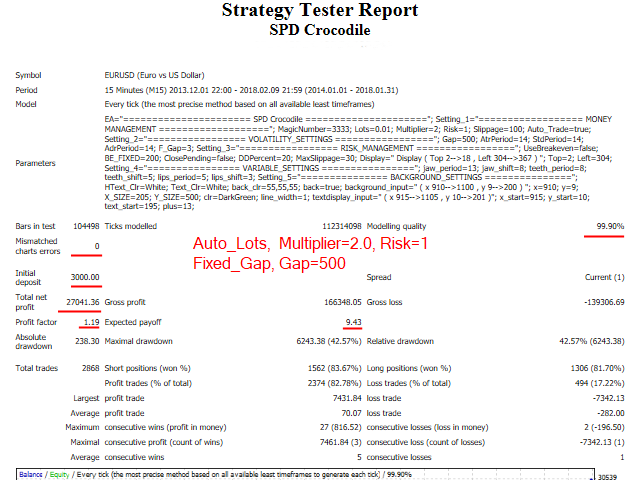 Auto_Trade - set as default. UseRecoveryGap - set as Dynamic_Gap or Fixed_Gap. Gap - recovery zone, pips. UseDynamicMethod - set as ATR, STD or ADR method. ADR - Average daily range. UseBreakeven - set as true or false. ClosePending - set as true or false. DDPercent - set the percentage to cut off the loss, % drawdown. MaxSlippage - Max slippage size, pips. Variable_Settings - use default or change values of variables by optimizing. jaw_period - Jaw line averaging period. jaw_shift - Jaw line shift. teeth_period - Teeth line averaging period. teeth_shift - Teeth line shift. lips_period - Lips line averaging period. lips_shift - Lips line shift. Display Function: Improved the display function. 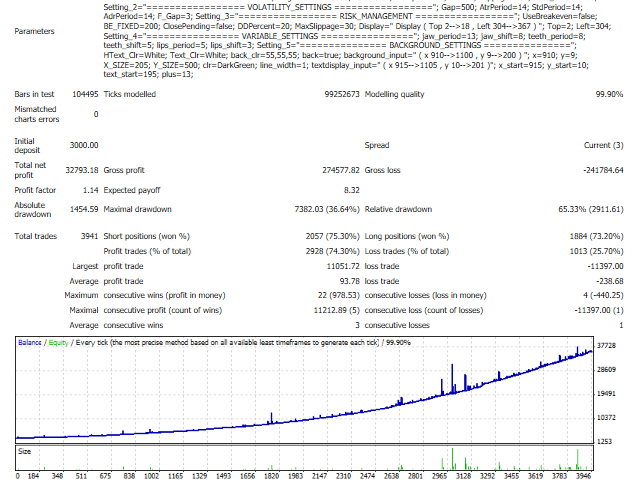 - Added a new parameter: URL_News "http://ec.forexprostools.com/"